Is “Digitalization” in your opinion the non-word of a decade or are you seeing it as an opportunity? Why is digital transformation so important for a sustainable successful future of enterprises? Has the digital transformation become a daily reality for business and citizens?The answers to those questions you might were able to find this week in Hannover, Germany, at the CeBIT – the world’s largest B2B-trade fair on digitalisation. There it made it very clear that the wave of digitalization is permeating every segment of the economy and society, transforming work and lifestyles around the globe at breath taking speed. From 14th until 18th of March the CeBIT opened its gates at the Deutsche Messe with its lead theme “d!conomy: join – create – succeed” to show the 2016 most fascinating trends and highlights in terms of new technologies and digitalization. The range of topics last from cloud and SaaS solutions to marketing and CRM to infrastructure, mobile solutions and security. A broad space is also devoted to trends like artificial intelligence, robotics, drones, Internet of Things or virtual reality. Thousands of people from all over the world were able to visit more than 3,000 exhibitors from 70 nations who presented their innovations and ground breaking business models and marvel at more than 400 application examples of digitalization and the Internet of Things from start-up companies. Their highlights got presented in the exhibition hall SCALE11 where Startups competed against each other in the Founders Fight Club and talented students participated in the InnoJam hackathon organized by SAP University alliance in cooperation with Volkswagen. On Tuesday, Chancellor Angela Merkel attended the CeBIT and took together with the Swiss President Johann Schneider-Ammann a two-hour tour around the exhibition. Overall, more than 220,000 trade visitors were expected in the halls of Deutsche Messe where around 200 speakers illuminate various social impact of digital technology. IDC forecasts that two thirds of the CEOs of the 500 largest European companies will move the digital transformation to the core of its corporate strategy to the end of 2016 based on the results of the latest IT-Kompass 2016 study, conducted by IDC and the Computerwoche exclusively for the CeBIT. One of the main-facts at CeBIT is that marketing and sales need to go the digital route to remain successful in the long run. Customers spend more time online than ever before – regardless of location, time or device. They are strongly linked socially and demand real-time information. Marketing needs to be automated, customer focused and targeted. Sales has to re-think to use the potential of digitalization. Nowadays the customer indicate the direction of the journey. More and more B2B supplier field have recognized the importance to go this direction, but are not yet ready for change, states a recent cooperation study of Roland Berger and Google (2015). 60 % see, that the digitalization of sales will be decisive for the business success in their industry. And another important fact states that 57 % of the purchasing process are already over when a sales representative will contact you the first time. So, who in the information and evaluation phase is not present, may come in the future not anymore on the short list of potential suppliers. In Hall 4, the Digital Marketing & Experience Arena, a diverse array of product displays and expert presentations addressing digital customer journey, marketing automation and demand- and lead-generation with the focus on digital transformation and new digital concepts in Marketing, Sales and Customer service. More than 300 exhibitors like SAP, Telekom, Microsoft and Software AG are using CeBIT to showcase the latest solutions for marketing automation, customer relationship management, big-data analytics and direct marketing. 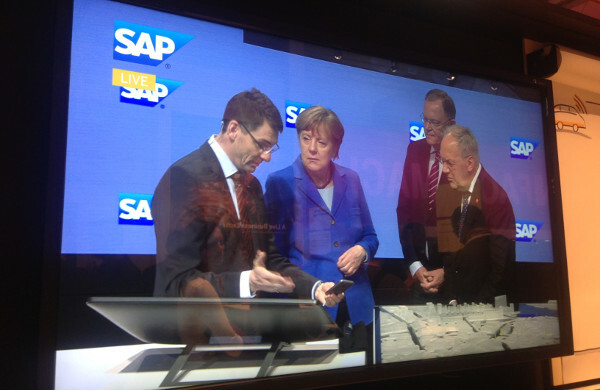 Several opportunities of digital transformation under the motto “Digital Transformation Is Happening Now” showed SAP. Real-world examples like personalized smoothies, networked filling machines from Siemens, smart vending machines and the digitalized football stadium showed innovations made possible by this transformation, with the SAP S/4 HANA solution. Telekom sets as well on cloud with a main focus on data security „made in Germany“. The corporate group promotes at the Deutsche Messe their new computer center, located in Magdeburg, where the customer data is in safe hands. The „Data-Fort-Knox“ has more than 30.000 physical server. With the slogan “digitales Wirschaftswunder” (German for “economic miracle”) Microsoft emphasizes on successful approaches and examples like an intelligent charging station for electric vehicles by ABB or how alnamic, a medium-sized company from Neuss, realized a modular manufacturing through the cloud. The city of Ulm shows how to enable citizens’ online access to information and can come about in the planning of major projects in direct dialogue. 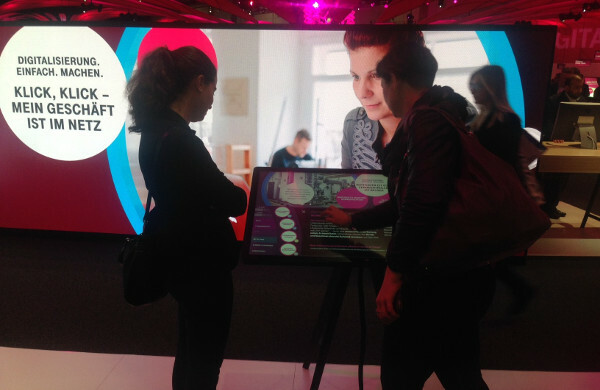 All in all the week at CeBIT was a highly interactive and impressive experience. It showed again that technology is not a halt, but keeps evolving at high speed which cannot be stopped. Therefore new ideas and concepts are essential to keep up. After this years’ experience the CeBIT has become a fixed date in the calendar and curiosity for next year is prospering already.